On a cold January morning in London my wife and I hopped on the Central Line and headed to South Woodford for breakfast at Cafe on the Lane. This turned out to be a very wise decision, the breakfast here is excellent and comes at a very reasonable price. Best of all though they serve some really nice slabs of bubble and squeak, definitely recommended! In February I was about to start writing regular articles for a local Magazine but a disagreement over editing was enough for me to pull the plug on this arrangement. 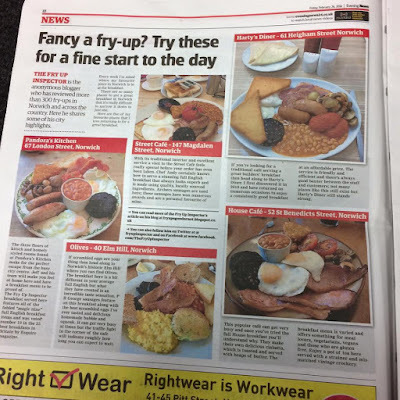 It seemed a shame to waste the article I'd written on my five favourite Norwich breakfasts though so I published it on my blog instead. The Norwich Evening News contacted me after I published it and offered to feature it as a full page spread on 26th February, it also made it onto their website. Jim Fennell from Salubrious Sauce Co in Woodbridge had sent me a bottle of their new breakfast sauce, it was delicious! It went incredibly well with a whole host of things ranging from steak to pasta, I was keen to try it on a breakfast though. Jeff Taylor at Pandora's Kitchen invited myself and Jim along to try the sauce on the Fry Up Inspector breakfast served at Pandora's, it was a match made in Heaven! Read about it here. I'd been hearing good things about the breakfast at Rockers Cafe at Krazy Horse in Bury St Edmunds for sometime. In March I decided to head out there with my wife to see what all the fuss was about. For less than £8 they were serving a great all day breakfast which included toast and a hot drink, bargain! In April we visited River Green Cafe in Trowse to try their vegetarian brunch. Chris Avey and his team had certainly created something very special. Good quality locally sourced ingredients and a delicious bubble and squeak made this vegetarian breakfast really stand out. The Rosebery in Norwich was May's breakfast highlight, less than £7 for their cooked breakfast seemed like a really good deal. The thing I remember most from this visit though was how envious I was of my wife's vegetarian breakfast, it tasted so good! Towards the end of May my personal highlight of the year was when my wife and I returned to Japan again. We visited Hiroshima, Yokohama, Nagasaki, Tokyo and Kyoto, this time we were here for 3 weeks and I planned on documenting everything along the way. I spent most of June writing about my time in Japan, I published a Japanese Food Adventure - Chapter 2 blog post everyday for 3 weeks. I needed another holiday afterwards! I was going to have to wait a bit longer for another holiday. 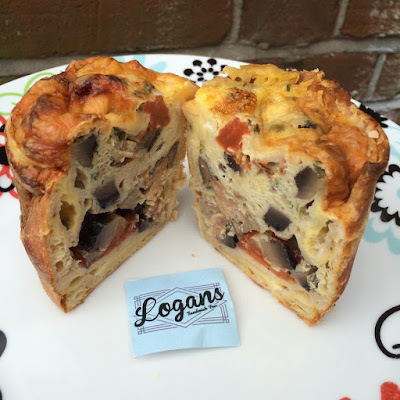 In the meantime though I did discover some delicious breakfast cups made by Logan's of Norwich, if you get the chance be sure to try one, they're exceptionally good! Another holiday finally arrived in July, a trip to Barcelona to attend two music festivals. The urge to write about this trip was great but I resisted it and had a relaxing trip away just occasionally posting on Instagram. With sushi and tapas fast becoming a distant memory I went on search for more great breakfasts. 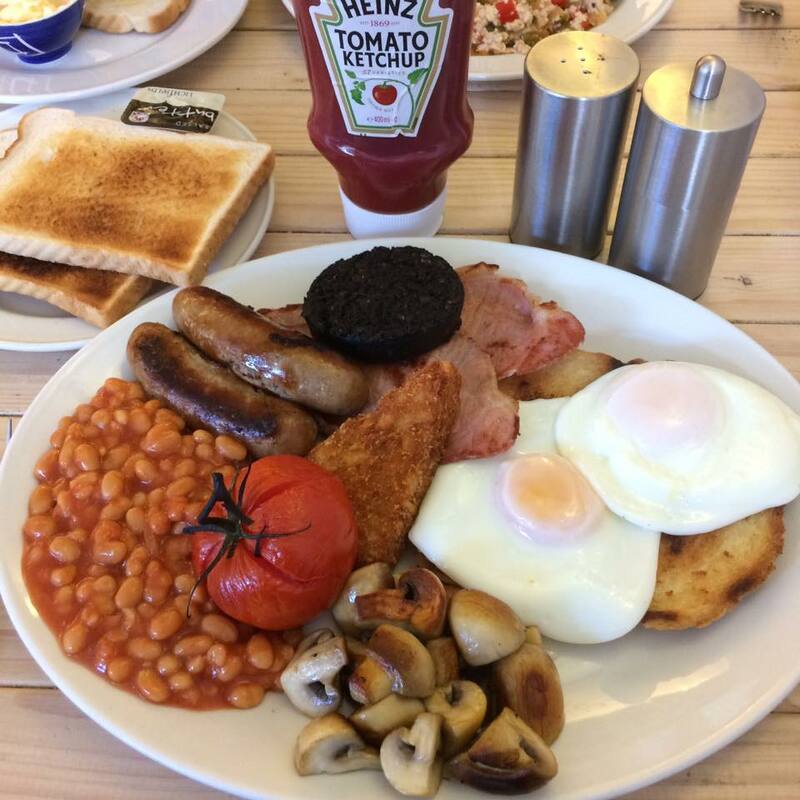 In mid July I visited Wroxham with my wife and we enjoyed a really nice breakfast at The River Kitchen. Located beside the river in Wroxham it's a beautiful place to enjoy a spot of breakfast. Also in July a weekend in London resulted in finding some more great places to go for breakfast. Beppe's Cafe near Smithfield Market has been serving its customers since 1932, and is a firm favourite with its regulars. This classic London cafe serves a good honest breakfast for under a fiver, a recommended sticker was sent to them straight away! The following morning we discovered Frizzante Cafe at Hackney City Farm. Their impressive breakfast featured locally sourced ingredients, homemade sausages and homemade beans. The friendly service and beautiful setting to enjoy a breakfast made it another recommended place to go for breakfast in London. 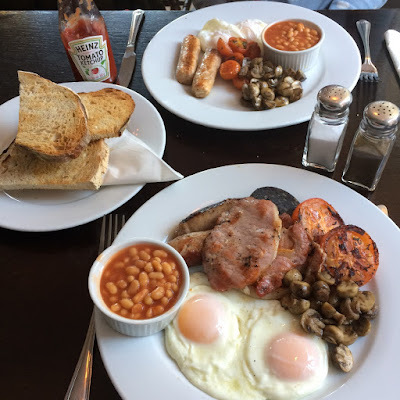 I was hearing lots of good things about the Gardener's breakfast at Green Pastures in Bergh Apton and I finally made the trip out there with my wife in August. Quality ingredients were used on this breakfast and the air dried bacon was superb! Another place was added to the Recommended section. Not much really happened in September related to breakfasts, I did finally got around to trying a Voodoo Daddies pizza though. 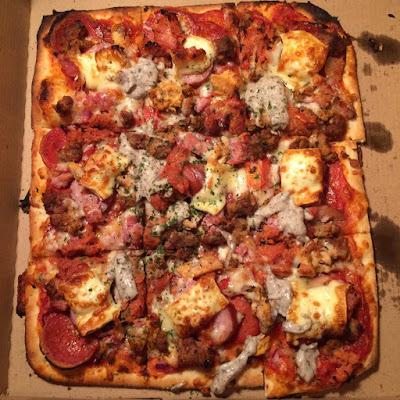 I ordered the beast (pictured above) and was really impressed, I usually find pizza's don't have enough toppings but with Voodoo Daddies the toppings are piled on thick. Within a week my wife and I went to The Plasterers pub in Norwich to try them again, sadly they were both overcooked. Voodoo Daddies were keen to put things right though and sent some more perfectly cooked pizzas out to us with a full refund. 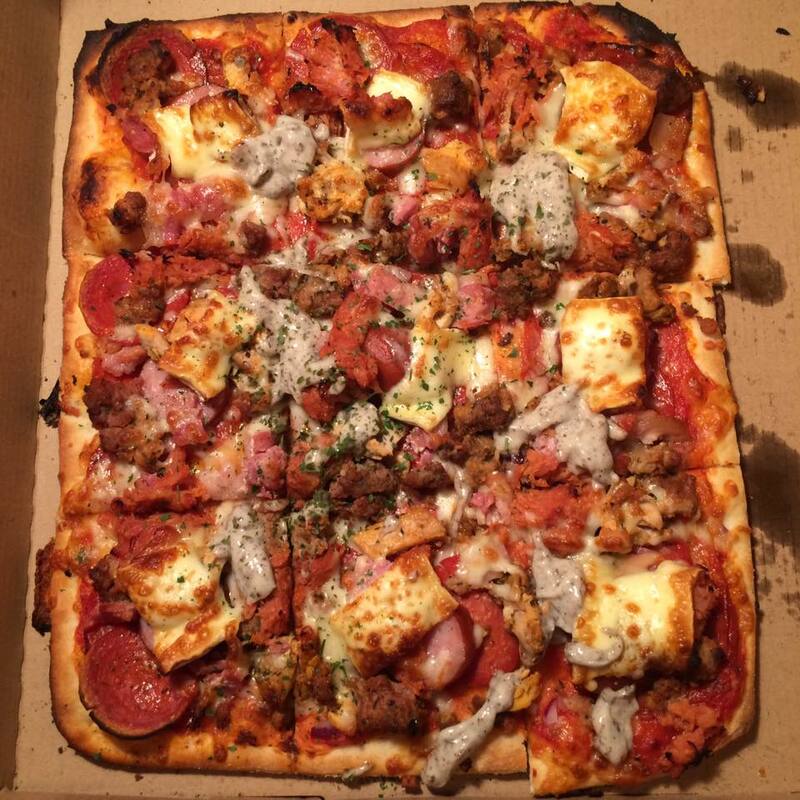 This is when I got to try the "Fat Elvis" pizza, the best pizza I've ever eaten! Not so much a highlight of 2016 but more of a surprise when in October I went with my wife for breakfast at The Galway Roast in Norwich. Trying to cook a Full English breakfast in a microwave can lead to shocking results as we both found out! They closed for business a few days later, the microwaved egg I was served will haunt me forever though. The Street Cafe is one of my favourite places to go for breakfast in Norwich. With me being so busy searching for new places to review I don't go there as often as I'd like. In October I revisited and thoroughly enjoyed Andy's legendary full English served with Archers sausages, as always it looked and tasted perfect! When I asked people on my facebook page where I should go for breakfast next time I'm in London the majority said Maggie's Cafe in Lewisham. I'm glad I asked as the £6.95 create your own breakfast I ate there in November was such good value for money. Maggie and her team were the perfect hosts and this place was clearly very popular. 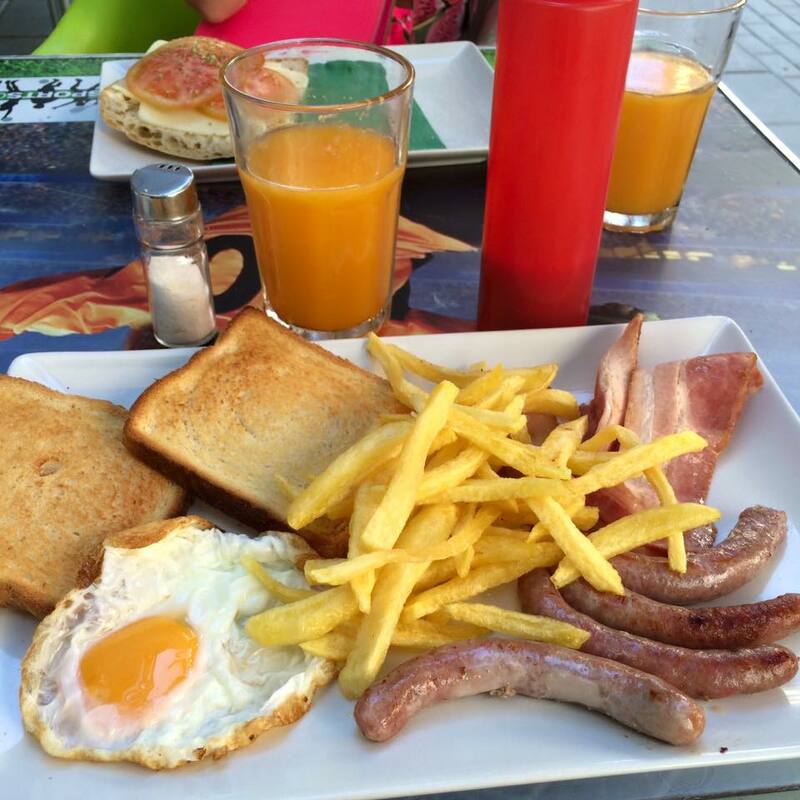 The drinks were constantly being topped up and choosing from over 20 breakfast items meant you could create something really special. Towards the end of November Storm in a Teacup opened on Elm Hill in Norwich, I went along to check it out. 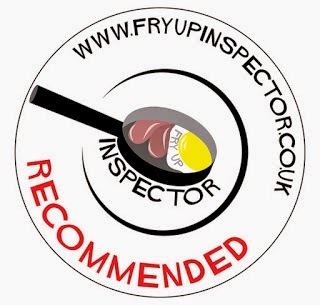 Excellent service, a friendly welcome and a great Full English breakfast ensured they made it into the recommended section of the blog. 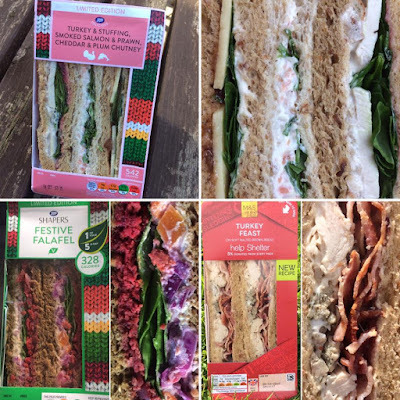 I couldn't resist trying the Christmas baguette from Urban Munch in Norwich, it was very messy to eat but tasted sublime! The baguette was packed with turkey breast, stuffing, sausages, onions, gravy and cranberry sauce. As I expected, the Christmas sandwiches offered by independents were by far the best bet! No trip to London in December is complete without going for Santa's Big Breakfast at Polo Bar opposite Liverpool Street Station. They're the only place I know of to offer a festive breakfast and the result is delicious. It features traditional breakfast items and is given a festive twist by adding homemade stuffing, festive beans, cranberry sauce and Cajun sweet potato chips. 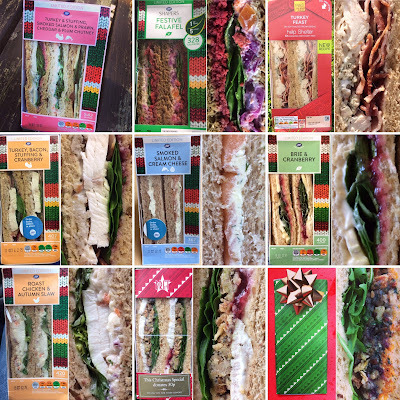 My final Christmas sandwich of the year turned out to be the clear winner and it was to be found at Archer's Butchers in Norwich. 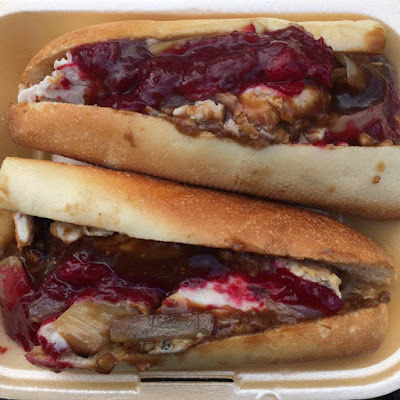 This baguette was stuffed full with turkey, onions, bacon, stuffing and cranberry sauce, seriously delicious! On Christmas Eve my wife and I made a last minute decision to go for breakfast at Olives in Norwich. We'd been here many times throughout 2016, this is one seriously impressive breakfast that just keeps getting better! 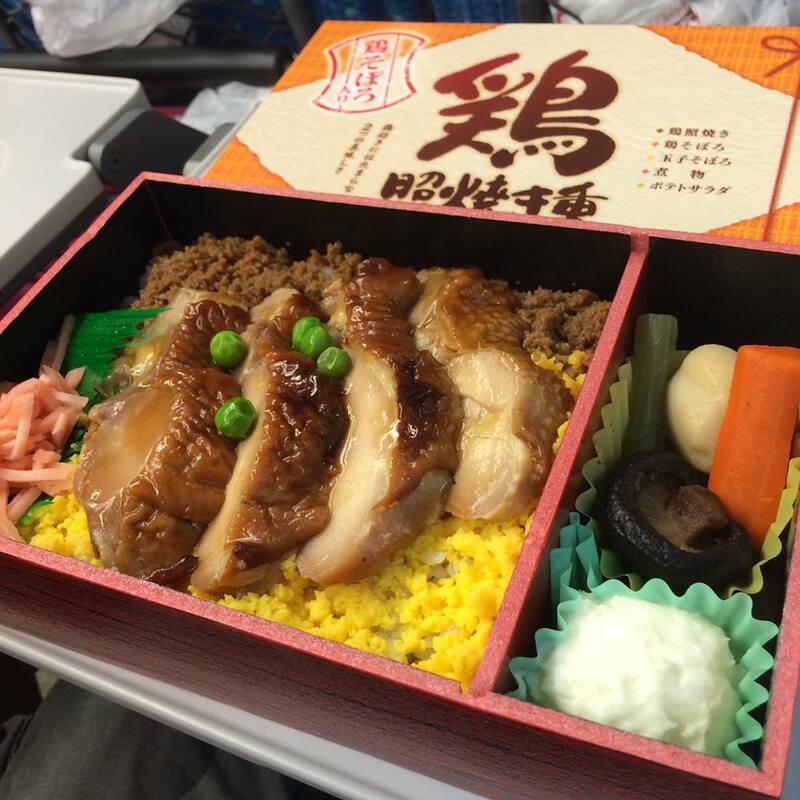 This was the perfect way to start Christmas and after eating this we didn't need any lunch. Many thanks for your support in 2016! Best wishes for 2017, F.U.I. (and Mrs F.U.I.) 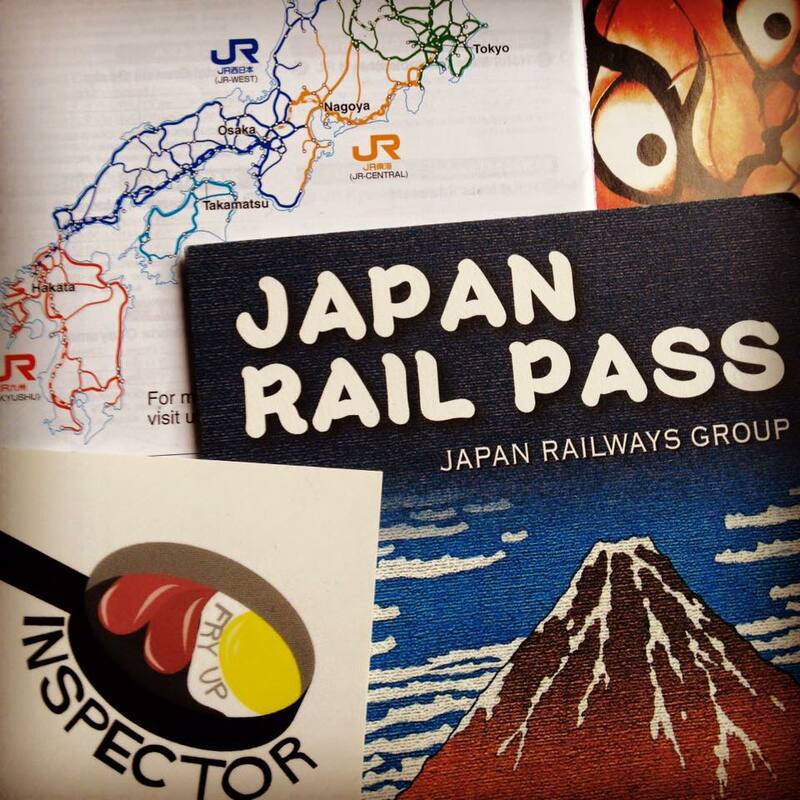 - thanks for the entertaining reading last year - especially the Japanese Adventure #2. Looking forward to more of the same this year! I'm a type 2 diabetic, and even a small amount of bread or potatoes sends my blood sugar soaring. 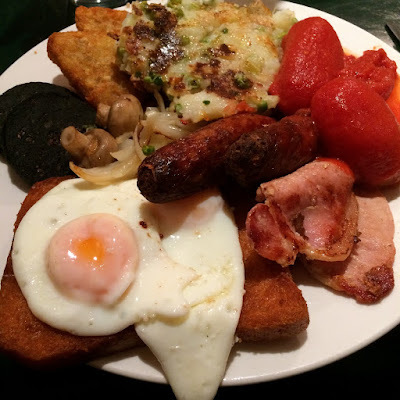 As you can imagine, this is a bit of a limitation for a proper full English. What I've found is a damn good substitute, and which has a much lower carb content, is if you take half-inch-thick slices through the neck of a butternut squash. You need to microwave them for a few minutes until they're beginning to soften, and then you can drop them in the frying pan to brown them up. They seem to have far less of an effect on my blood glucose than potatoes or bread.